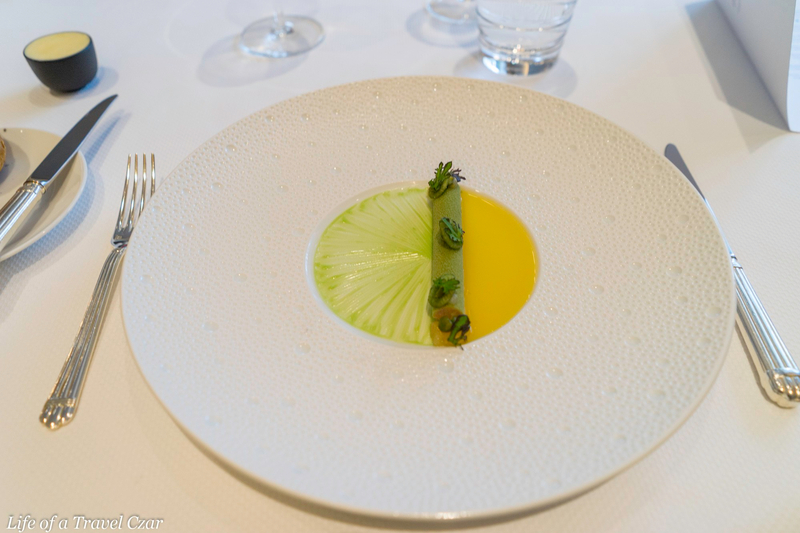 L’Hôtel de Ville is one of only three restaurants in Switzerland with three Michelin stars. 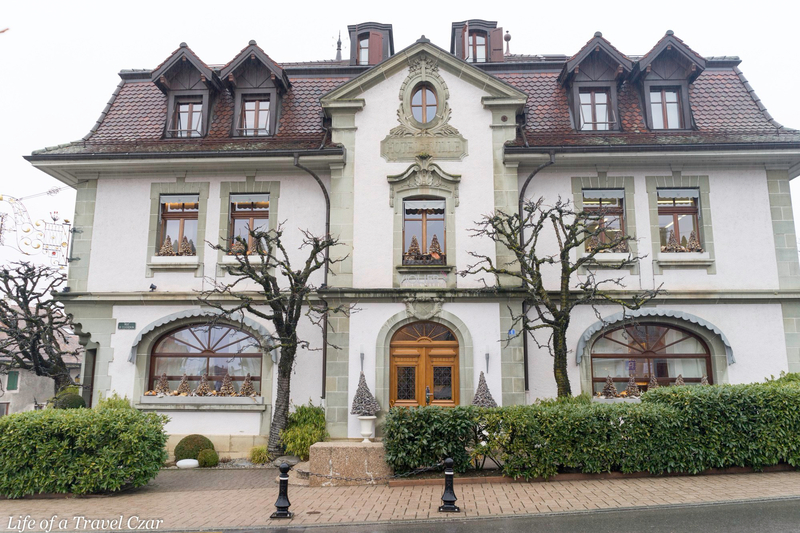 The restaurant is located in the rather unassuming town of Crissier, which is west of Lausanne. The restaurant’s stone building looks akin to a clock shop I visited in the Black Forrest may years ago. It appears identically symmetrical at the front with a dark brown roof, white stone and light grey / green stone around the windows and centre columns to contrast. It exudes a stately presence and is quite out of place compared to the other buildings which surround it. 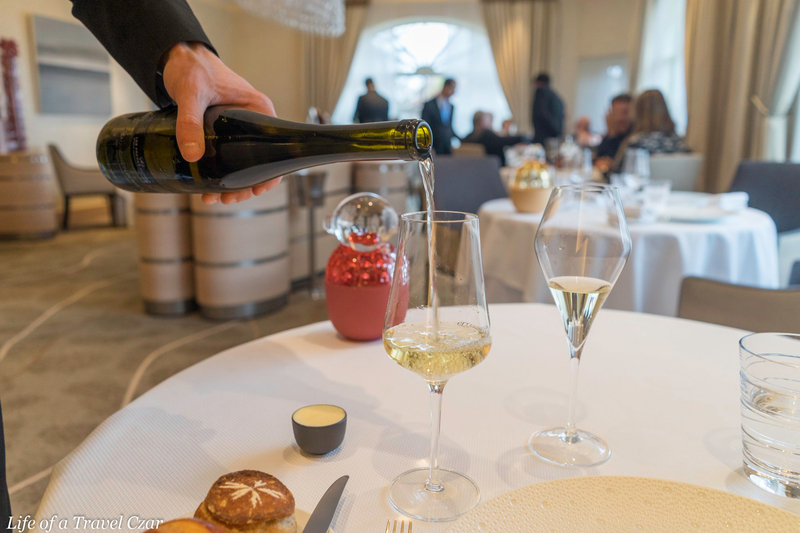 The restaurant has quite an illustrious history being awarded three Michelin stars under its four consecutive chefs over a period of two decades. Frédy Girardet father purchased the building in 1955 and started the restaurant as a petit bistro. 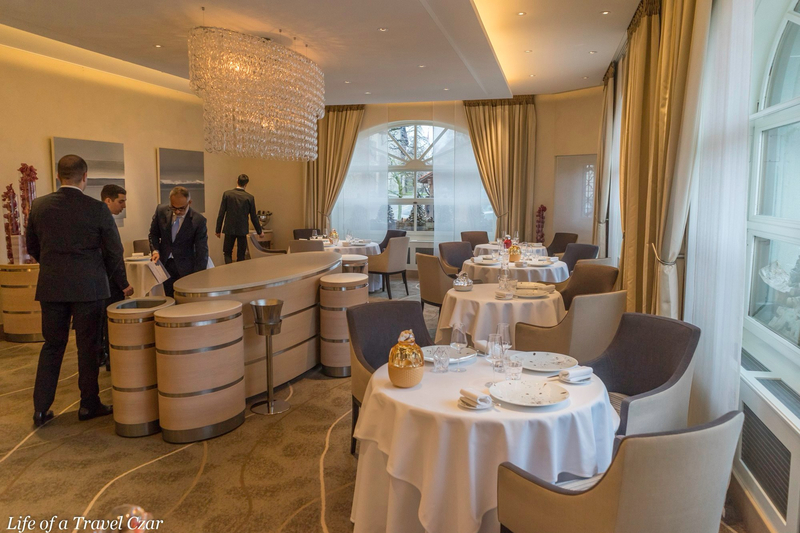 After he passed away in 1965 Frédy Girardet revamped the bistro into a restaurant. 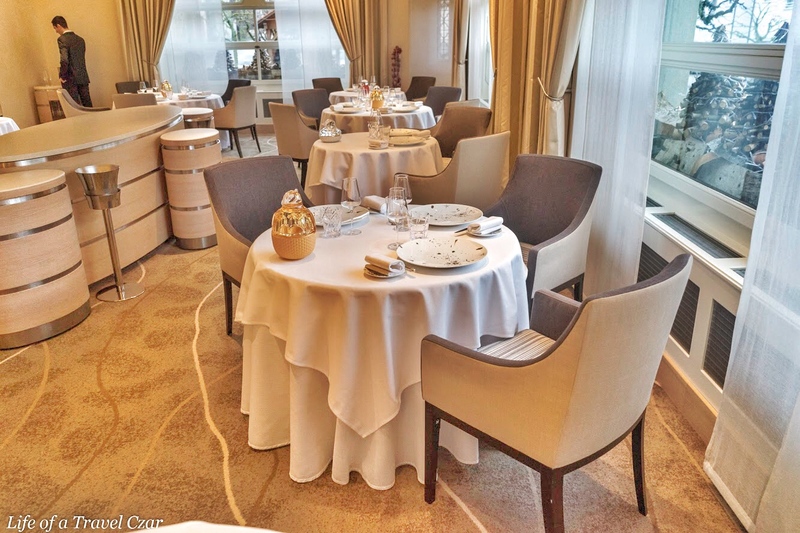 The restaurant was awarded three Michelin stars in 1992. 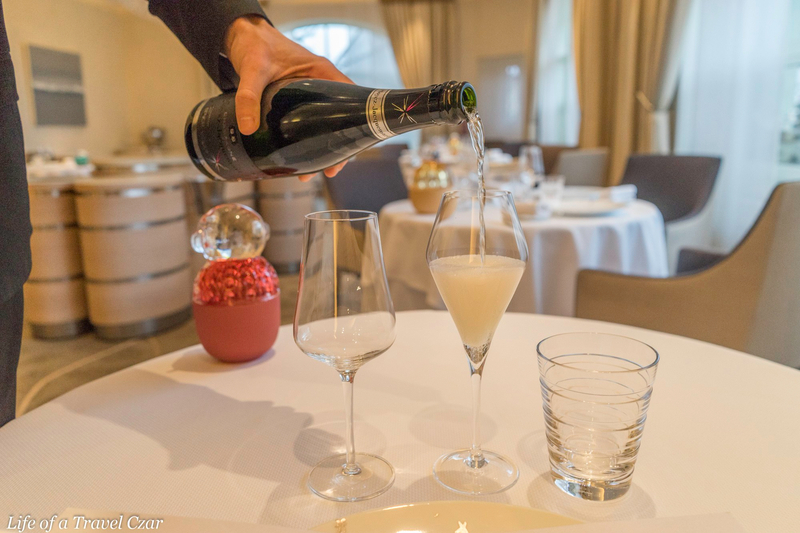 In 1996 ownership transferred to Philippe Rochat upon Girardet’s retirement and Rochat maintained the restaurant’s three Michelin star status. In 2012 Rochat transferred ownership to Benoît Violier. 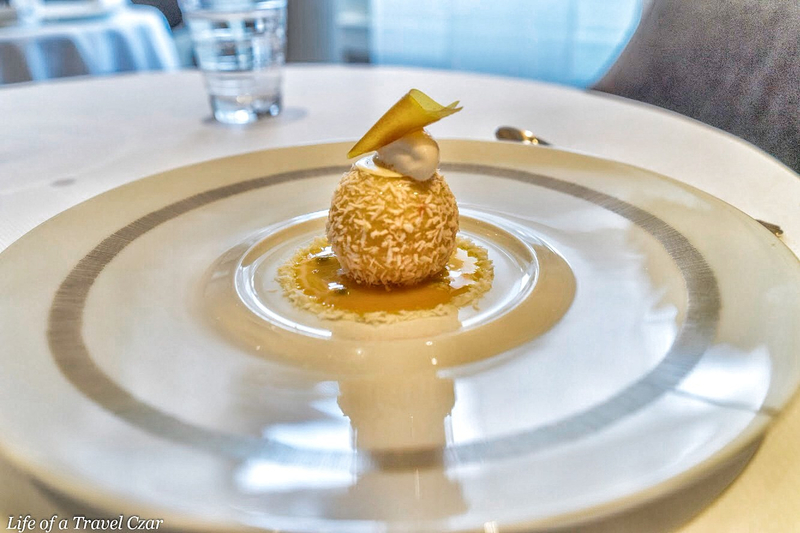 Benoît Violier successfully maintained the restaurant’s three Michelin star status. However tragedy struck in 2016 with Benoît Violier’s suicide. 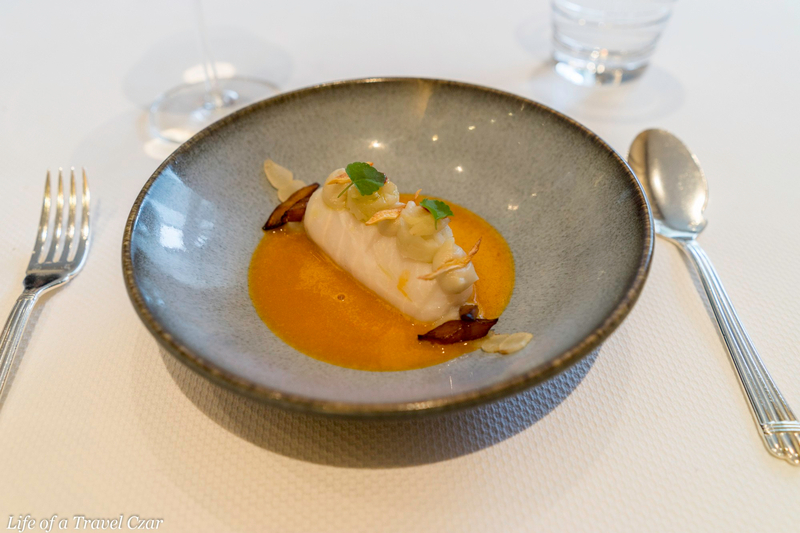 His wife Brigitte continued the restaurant with Chef Franck Giovannini taking over the kitchen. 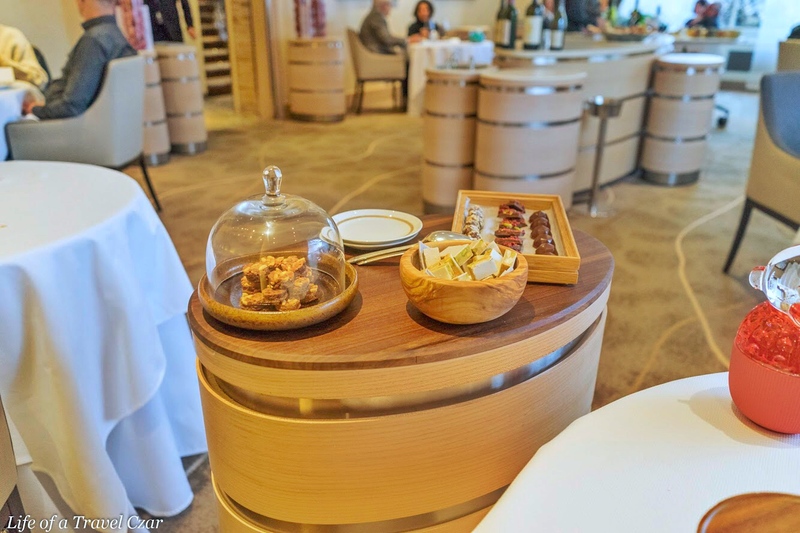 Giovannini has also maintained the high standards with the restaurant continuing to enjoy its three Michelin star status. The dining room has generously spaced with large tables and centre stand the middle to assist the waiters in placing dishes from the kitchen ahead of serving. There is also a solitary kitchen table. 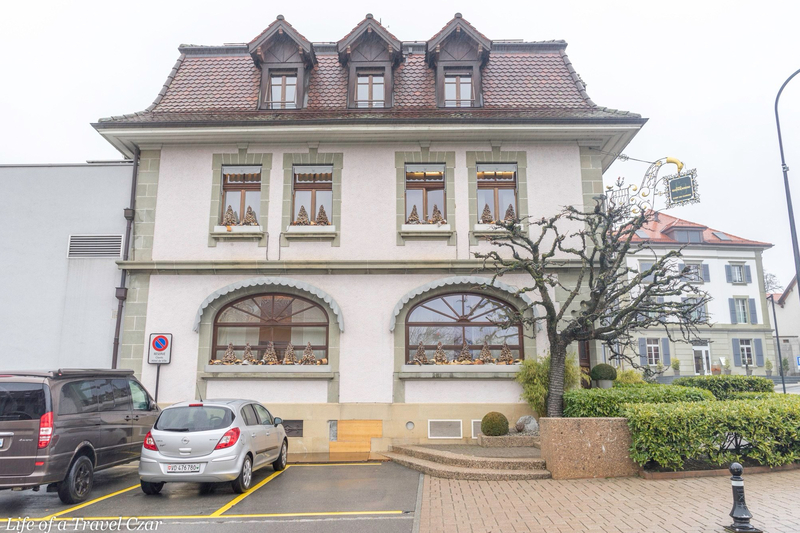 The dining room exudes a traditional Swiss conservative formality which is more my style. White linen tablecloths and soothing light-toned colours are the order of the day. Some interesting paintings break with the conservative streak, but they are not the focus. The beautiful chairs have cream coloured backings and neutral chocolate fabric on the inside of the chair with a striped cushion seat. To provide some contrast, bright translucent mini sculptures are placed on each tables as centrepieces. I have a champagne to start. The champagne is from a boutique vineyard which created a special offering / label for the restaurant. On the nose the there is fresh citrus, floral notes and a light hint of buttery bread. On the palate there is a forceful hit of stone fruit and citrus with hints of nuts in the finish. It’s a good apertif and nice fresh acidity to start the afternoon’s proceedings. 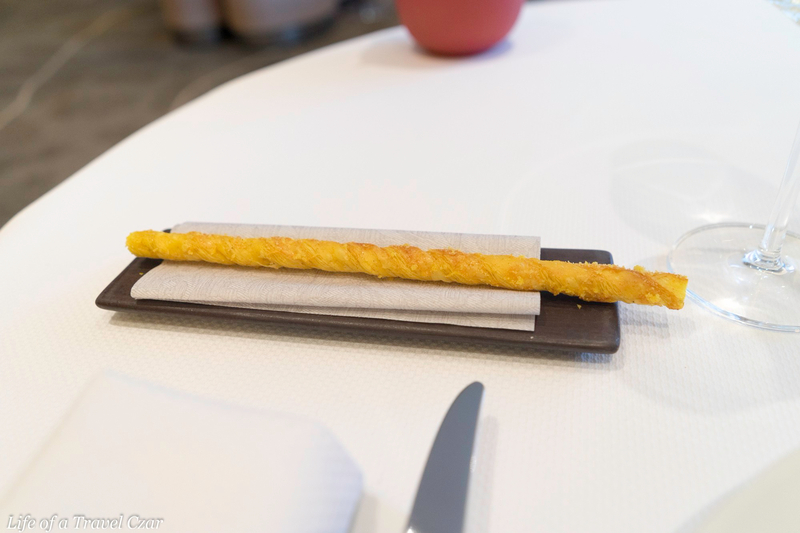 To whet the palate we have a cheese puff pastry twist. It’s crispy, tart, salty and its crisp texture strokes the palate. The good flavour and texture are lovely to wake-up the taste-buds ahead of this marathon. The scallops are wrapped in parsnip and carrot on top of orange crème. 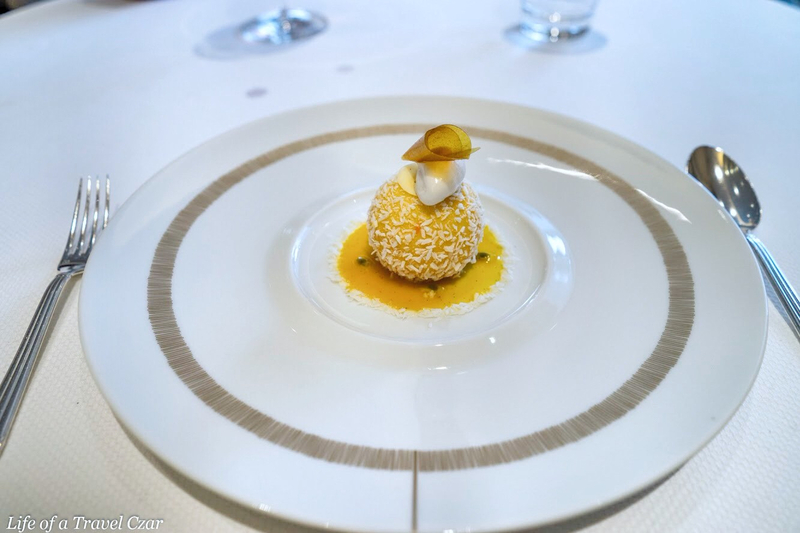 The light orange crème has lovely citrus which cuts through the scallops while the curried spice which adds another dimension to the dish. The crunchy textures of the parsnip and carrot nicely contrast with the soft jelly like texture of the scallop. The dish is paired with a Riesling from Alsace. 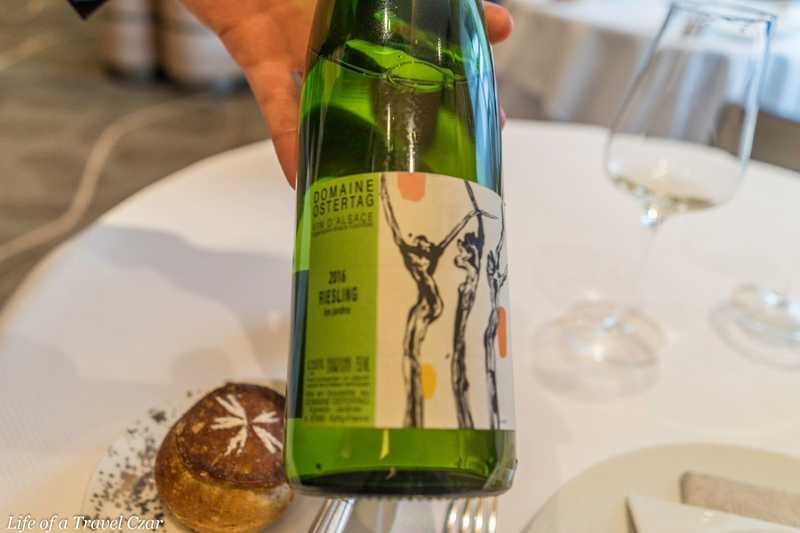 2016 The Riesling has some good fresh acidity and light bitterness in finish but it’s certainly not a sharp in its acidity or as mouth-watering as some of the Australian Rieslings I’m used to. There’s some lovely fruit (mix of green apples, honey and lemons) which goes nicely with the curried spice. This dish is about the aesthetics. 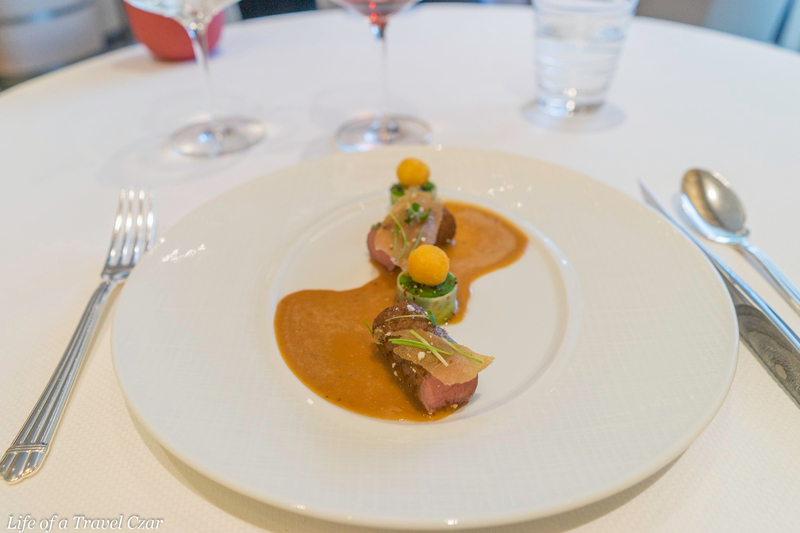 The green pistachio dust covers a log of duck foie gras which is placed on the middle of the dish. On one half of the dish we have an apple jam with a streaked texture and on the other side there is the apple cider sauce. 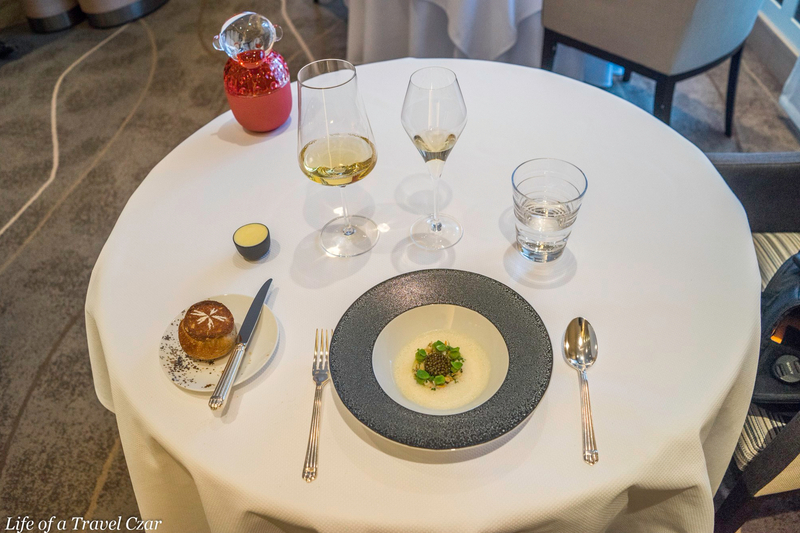 The dish has own tart acidity in apple and cider to balance richness of foie gras. The lovely light grainy pistachio dust adds some nice textural contrast to the jammy sauce and buttery foie gras. 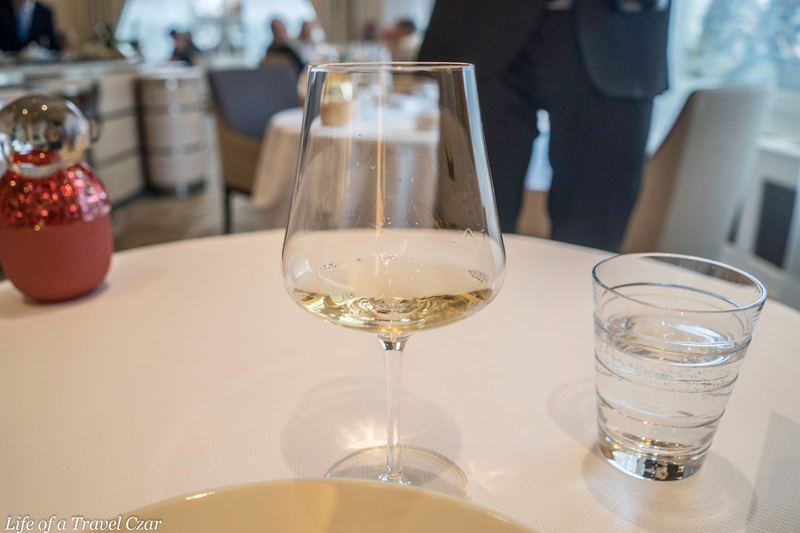 This is a classical, refreshing white wine from the canton Vaud. 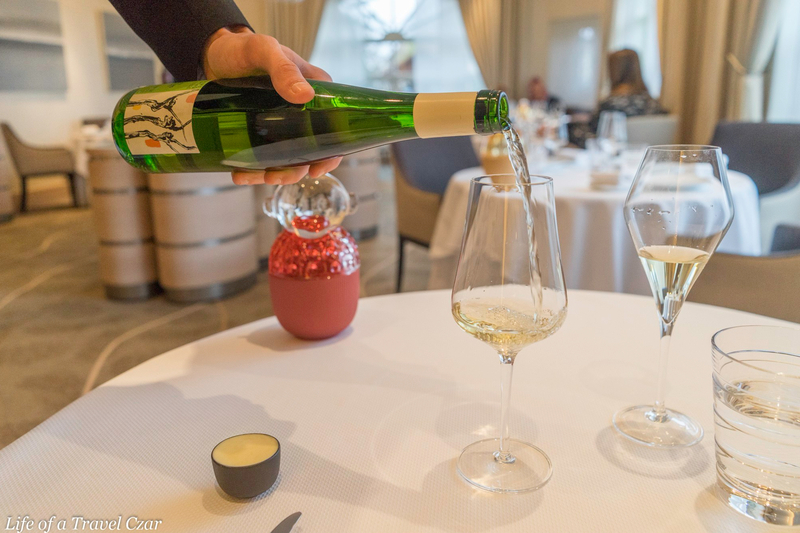 This wine is more aromatic and is more full-bodied and buttery with less of the acid than the Riesling. 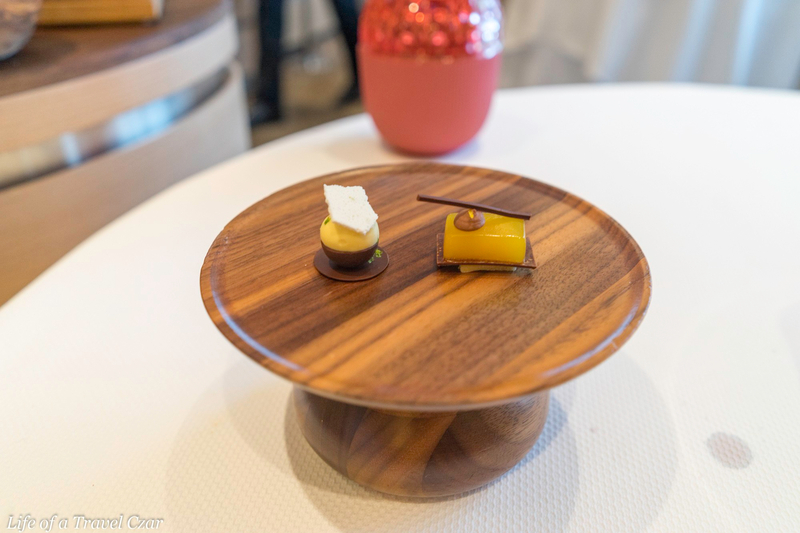 The rich stone fruit and buttery notes (akin to brioche) is perfect to match the full flavour of foie gras. The clams which are from Cotes des Legendes (which is near Brittany) have a beautiful rich saline flavour with a beautiful smooth texture. 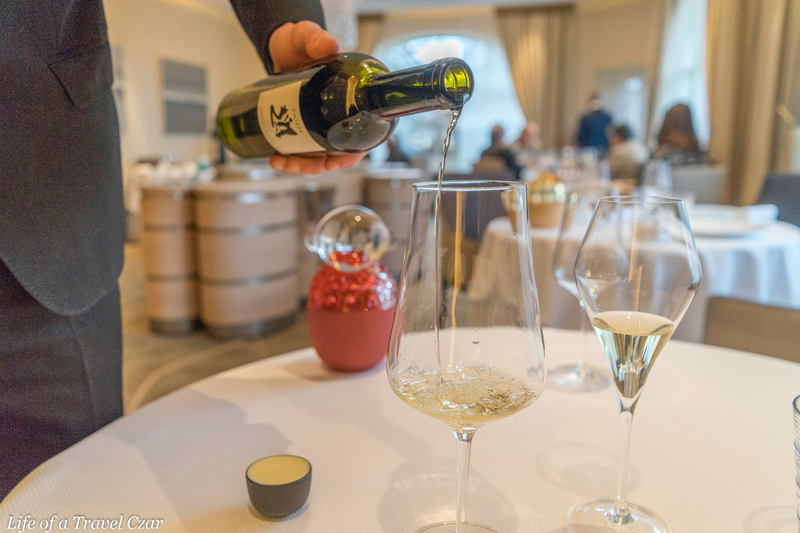 The creamy Chasselas wine (a variety of white wine widely grown in Switzerland) sauce has light fruit flavours and a foamy texture. The caramelised lettuce has a lovely smoky sweetness to which blends in nicely to the sauce. 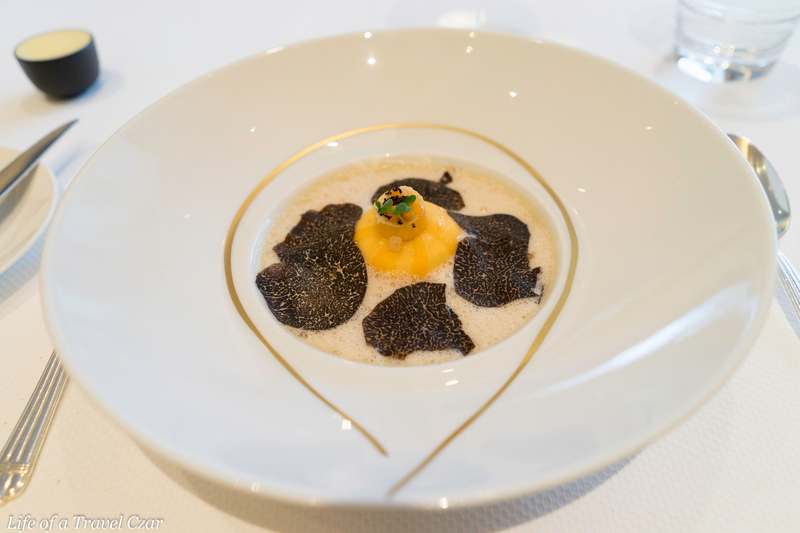 The clams should be the star of the dish, but the caviar in the centre asserts its authority and leaves the most indelible impression on the palate. The caviar’s rich sensuous salt and oils with its slimy texture proves a haven for the senses. 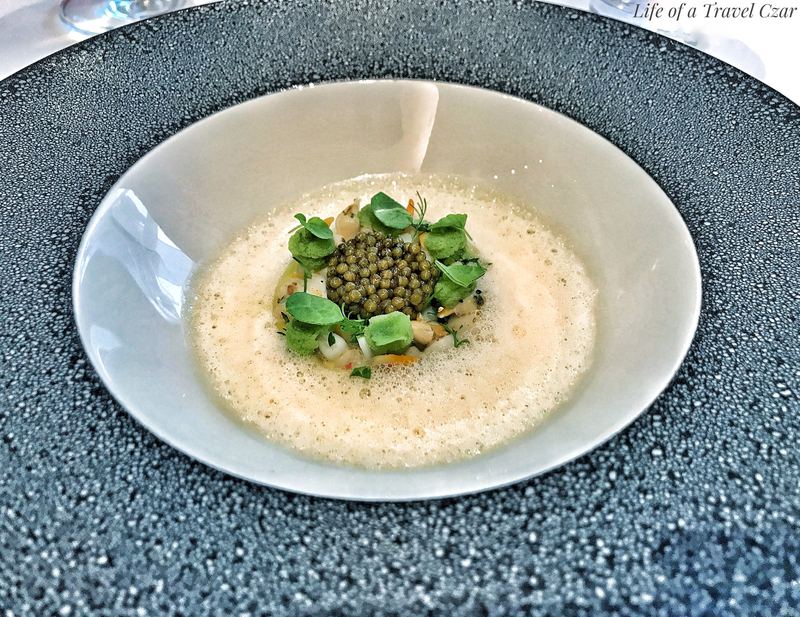 This is dish defined by it’s richness – the clams, the creamy sauce and the caviar. The wine is a Savagnin from Switzerland. 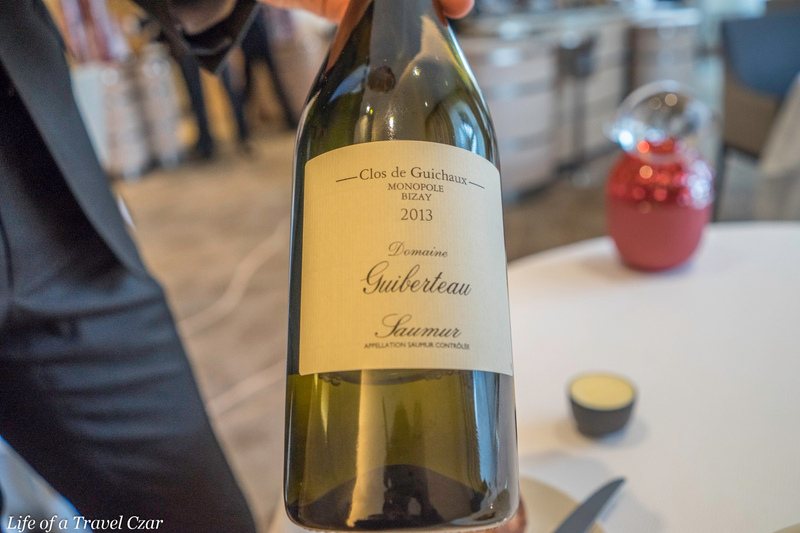 It’s got very good acidity and minerality which is needed to cut through the richness of the dish. It hits the palate pretty hard and is mouthwatering flourish. There are good notes of citrus which dominate the nasal senses, the initial flow on the palate and the finish. This dish is an eclectic mix of the rich creamy and with light citrus notes from the Verdelho, the earthiness of the truffles and the delicate texture of the cardoons. 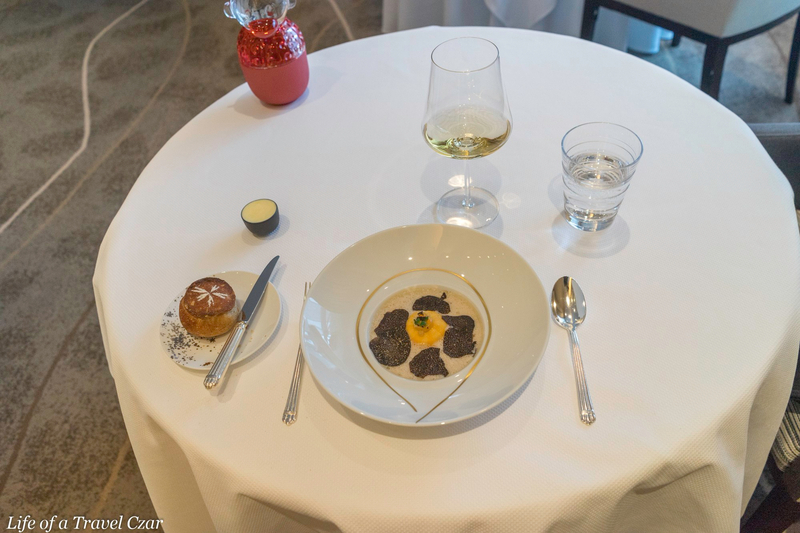 There is a sense of wonder about the dish, the cream has a delicate flow while each bite of the truffle with its special touch on the palate. 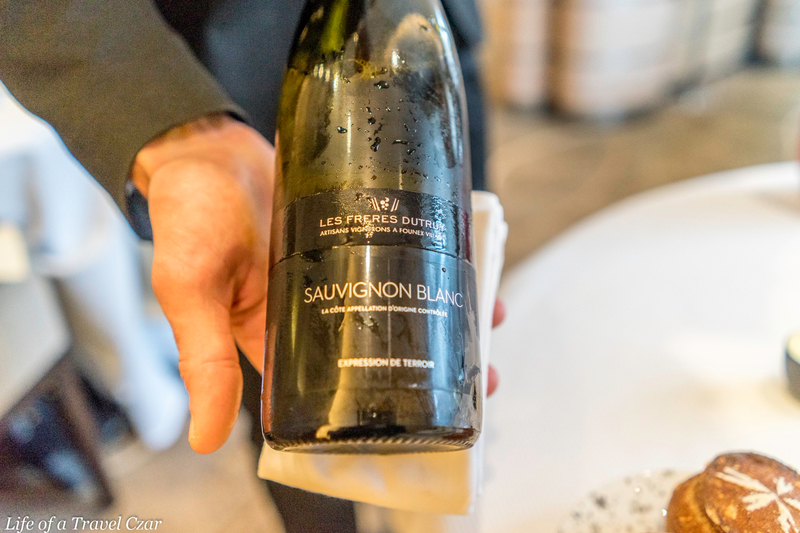 This wine is from the Loire Valley. The wine has some nice aromas of grapefruit, stone fruit and a little apple (which appears odd but anyway). 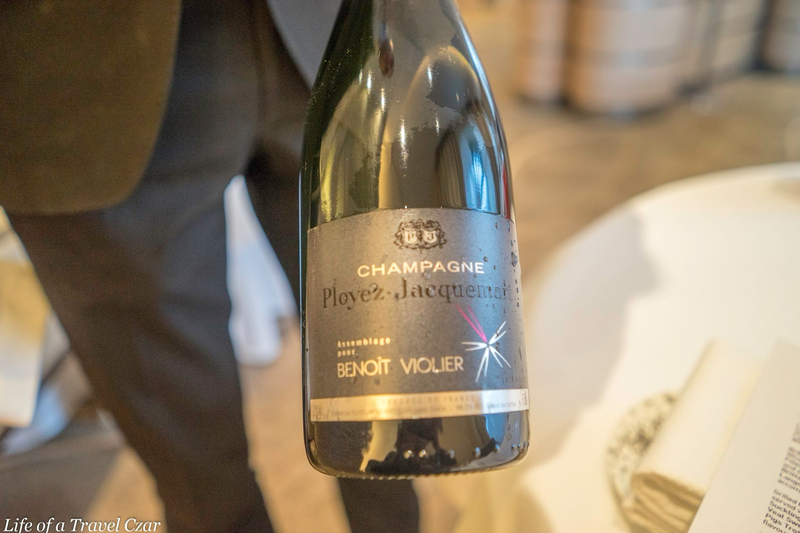 On the palate there is a good flow of saline freshness with grapefruit, lemon peel and apple notes. In the finish there is a kind of flinty and stony touch which lingers a little. 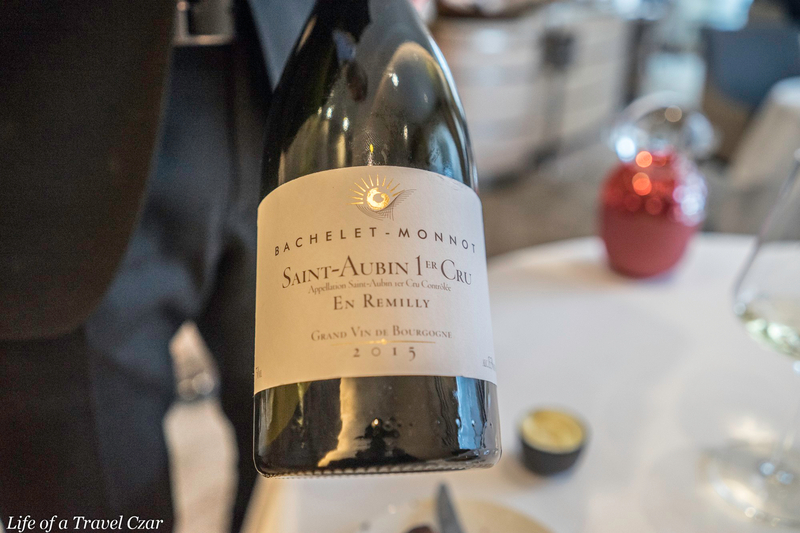 The wine is well rounded to support the dish, there is good acidity to tackle the creme and some nice fruit notes to battle the strength of the truffle flavours. The Pollock is soft and succulent and just falls apart on the fork. It is mixed with the delightful richness and acidity of its accompanying sauce. 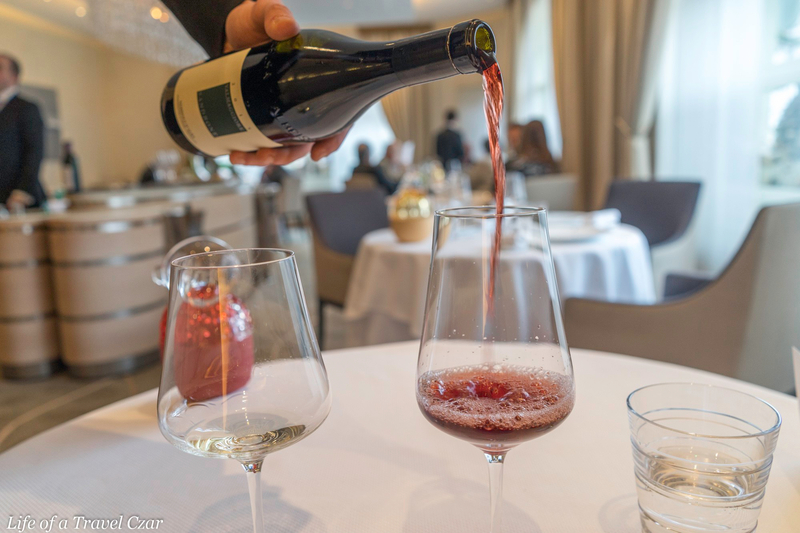 The Dezaley wine (which is a wine appellation in the Lavaux region in the Canton of Vaud) flows with some lovely sweet fruit undertones of the wine albeit in this is it is more overpowered by the tart seasons of the sauce and other ingredients in the dish. 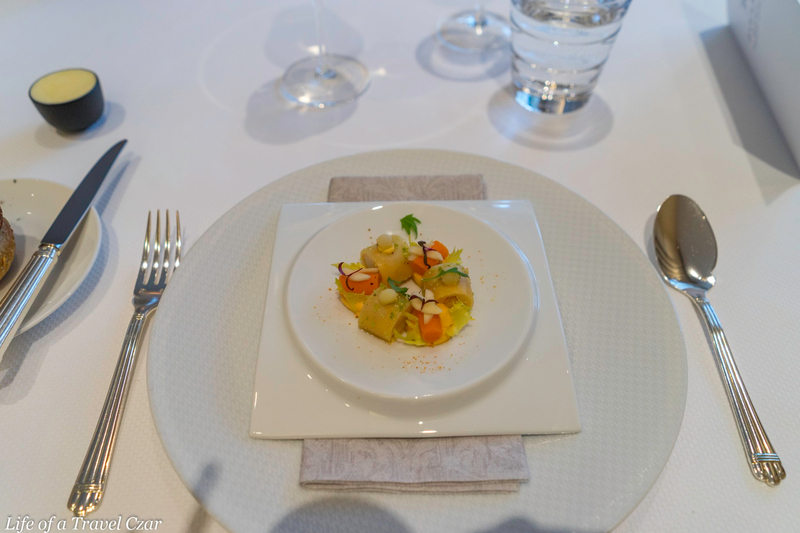 The escabeche of local vegetables are refreshing on palate. This is just classic Burgundy. I was oh so excited when it was presented to me. I let it dazzle me on the nose with aromas of light melons, stone fruits, expressive florals and a touch of flint. On the palate it’s just oozes a mineral salinity with some lovely peach, apple floral notes. My favourite wine of the afternoon so far. 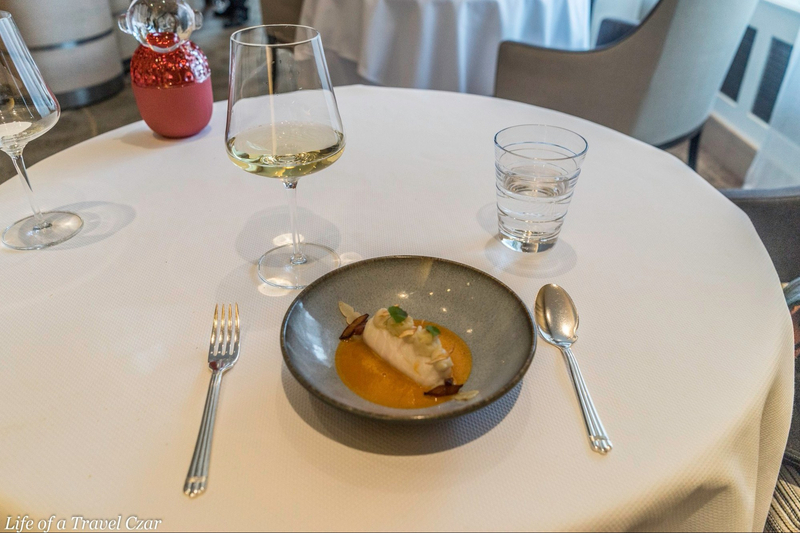 The thing with the wine is its beautiful acidity, rich creaminess and minerality cut through the strength of the sauce and provide beautiful flavours to pair with the subtle sweet Pollock. A wonderful combination. The dish is classic. There’s the sweet juicy lobster imbued with cognac and a rich sauce. The sweet juicy lobster is a treat when mixed with the rich sauce with acidity which pairs wonderfully with the lobster. 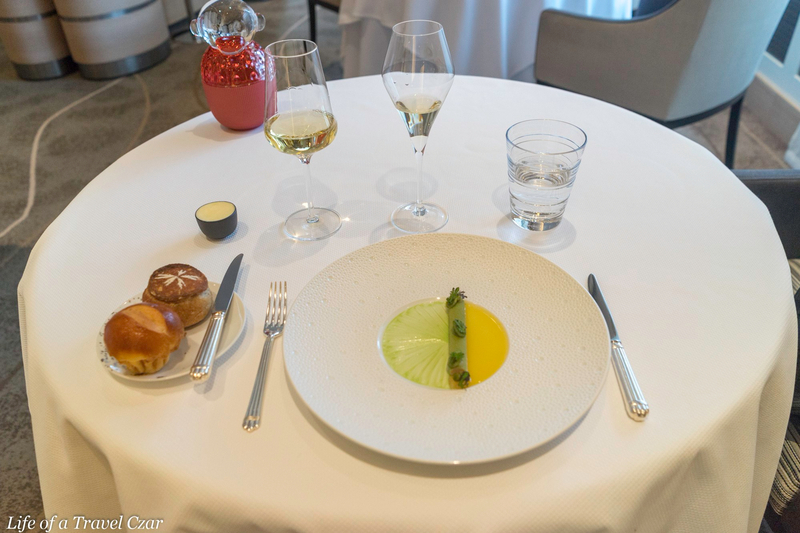 There are light fruit, honey and aromatic flow still resident from the cognac which adds a nice touch, while the vegetables in the dish offer a nice textural contrast. It’s an odd combination. I do a double take and briefly question the Sommelier on the choice. The wine has beautiful red fruit and floral aromas on the nose. 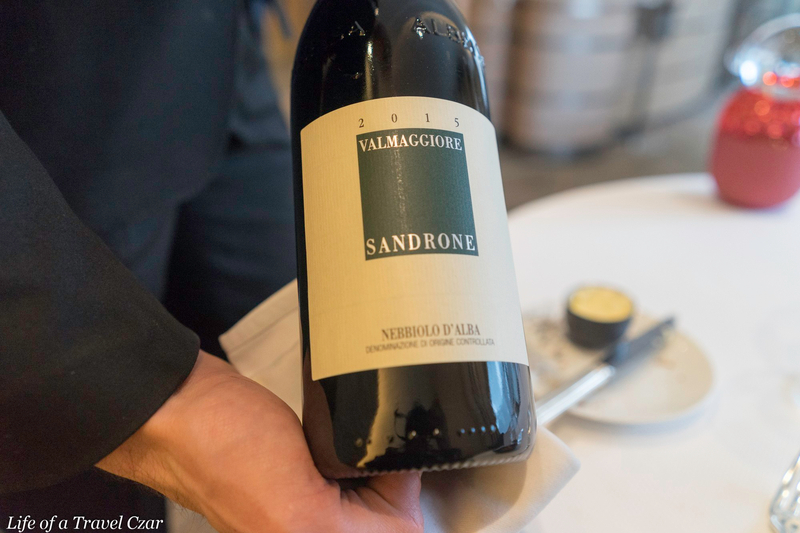 This Nebbiolo has more blunted fruit such that it doesn’t overpower the lobster but has a gentle fruitiness with good acidity which gently pairs with the dish. 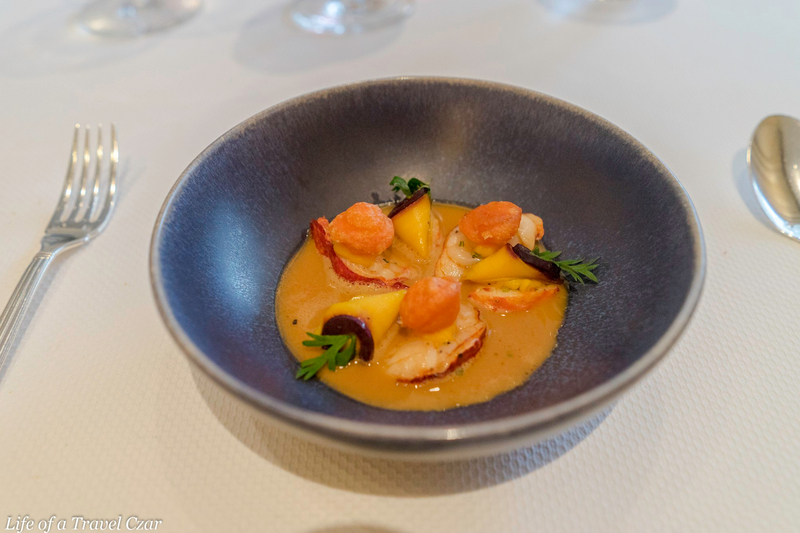 There are silky tannins which do help cleanse the palate and actually assist in drawing out the full flavours of the lobster on each bite. The lamb has a nice charred outer crust with a pale pink rareness throughout. The rich juices and flavour of the lamb assert themselves. The mustard sauce carries sufficient strength to match the lamb’s flavours. There are potato balls placed on top of the leeks to add texture and flavour contrasts. There are also beautiful crispy like shards of (what I think is potato) for a textural contrast. 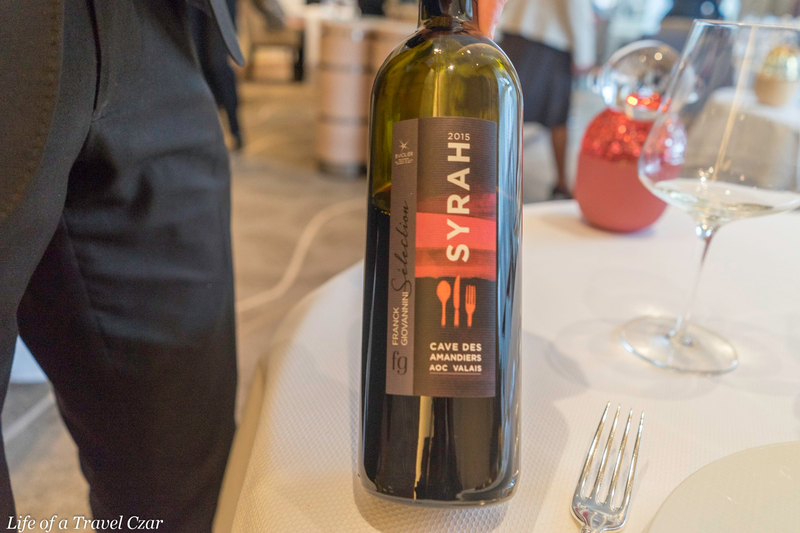 The Syrah has beautiful perfumed plums and pepper aromas on the nose. On the palate there is the strength of plums with good acidity to balance and some good grippy tannins to match. There sufficient strength of fruit to match the flavour of the lamb and also good tannins to deal with the rich fats and oils of the dish. The next course is a selection of cheese from the trolley. 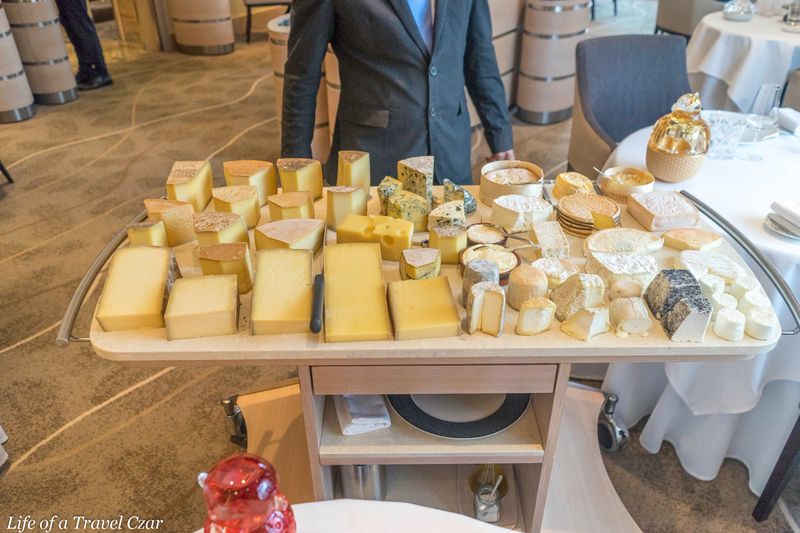 I am presented a very large selection of local and international cheese made from a variety of cow, goat and sheep’s milk. 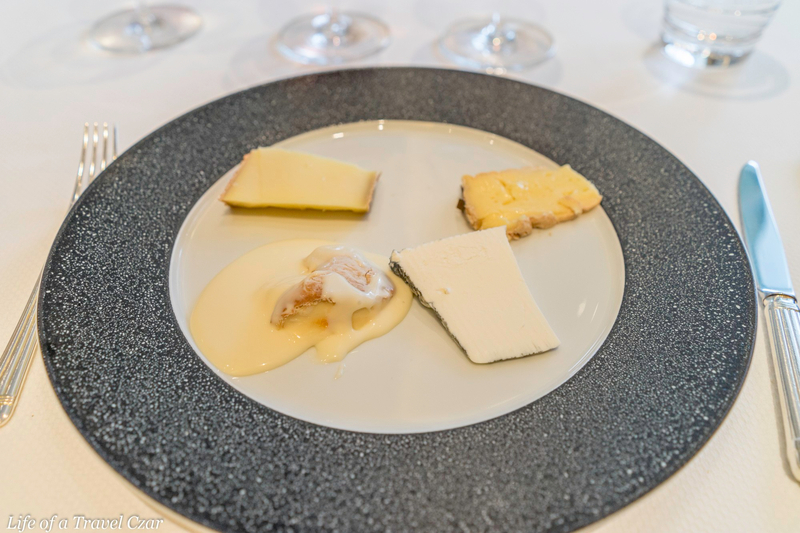 I choose a mix of hard and soft cheese from different milk sources for the course. This would have to be one of my favourite wines of the afternoon. 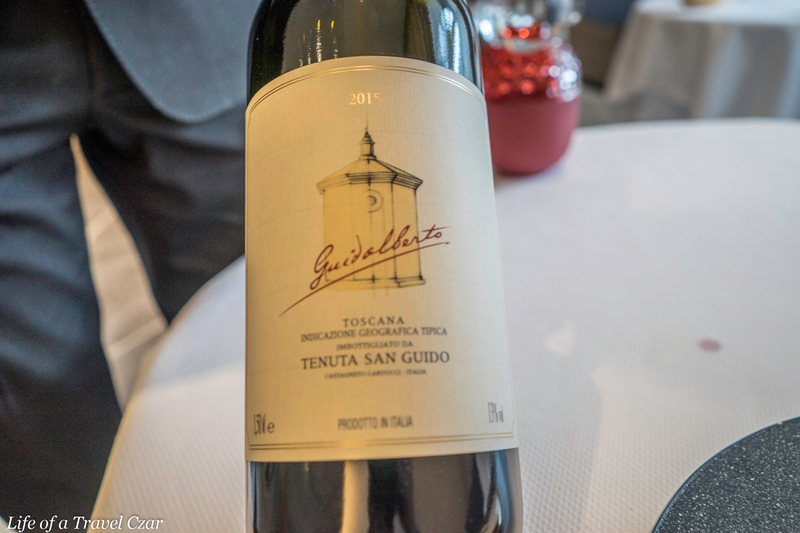 It is lovely blend of Cabernet Sauvignon and Merlot and is second wine of the Sassicaia (which I did have the pleasure of tasting last year at Mugaritz in Spain). The wine has rich aromas of red and black fruits which are so immediate. 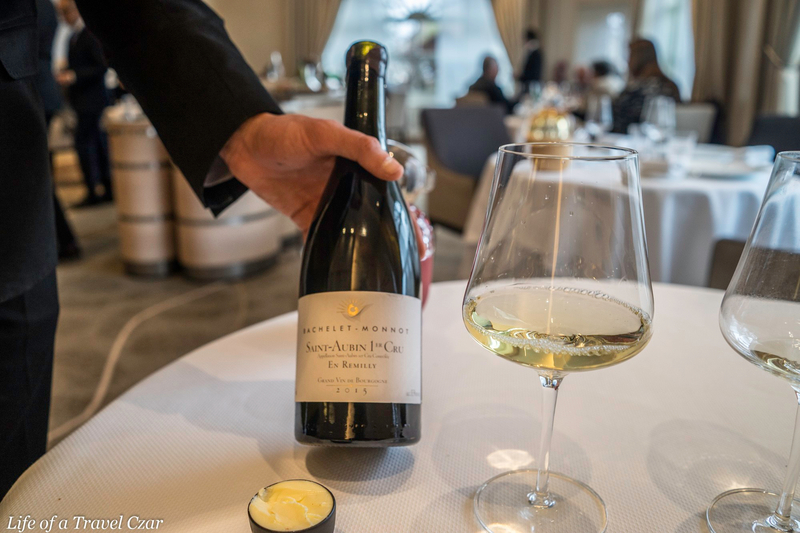 On the palate, this is true to reputation which precedes it, the wine is dense and has a beautiful silky texture on the palate. The flavours of cherries and light plums dominate initially however notes of tobacco, aniseed and violets follow. The tannin structure is perfect without being too grippy but gently flows in the silky nature of the wine. It has a long finish which one can savour. 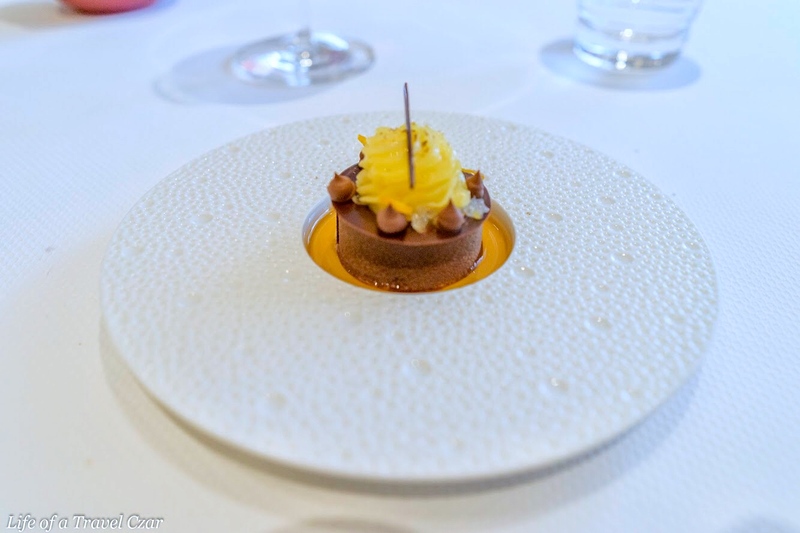 The dessert is a rich velvety chocolate tart which is paired with citrus base. It has a lovely texture a mix of fruit and cocoa. The flow of the Clementine with its citrus allure and the intensity of chocolate make for a taste sensation. This is a dish which ticks all the boxes, aesthetics, textures and flavours. The ball just explodes in you mouth with a cool ice snowy kinda hit, there is the extreme fruit flavours, the milky coconut snow . I am not sure how its made or how it worked on the palate but the flavour hit is extreme, its a mix of crunch, snow and creme which oscillate within the tongue for a wonderful flavour hit. It’s a truly magical dish which probably has no comparison to any dessert I have tried. 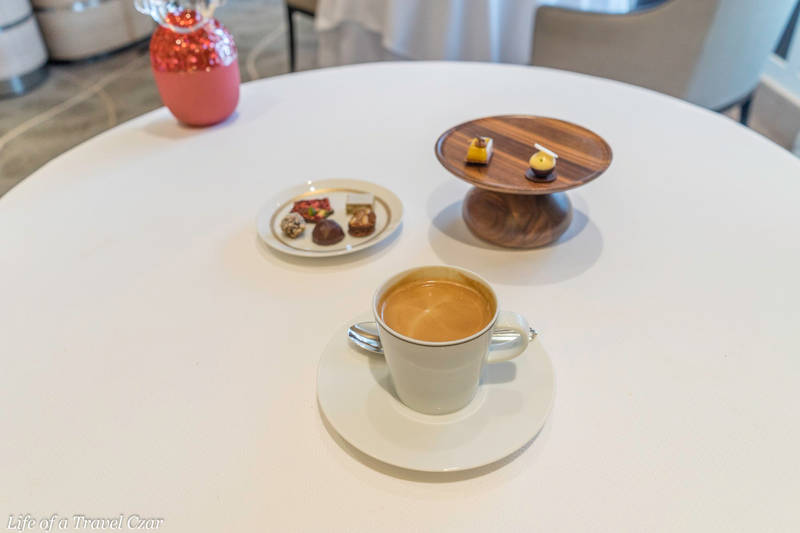 A selection of sweets and chocolates are brought out with some coffee to end the afternoon. I couldn’t complain about the coffee or the chocolates / sweets and they provide to be a lovely way to end the afternoon. 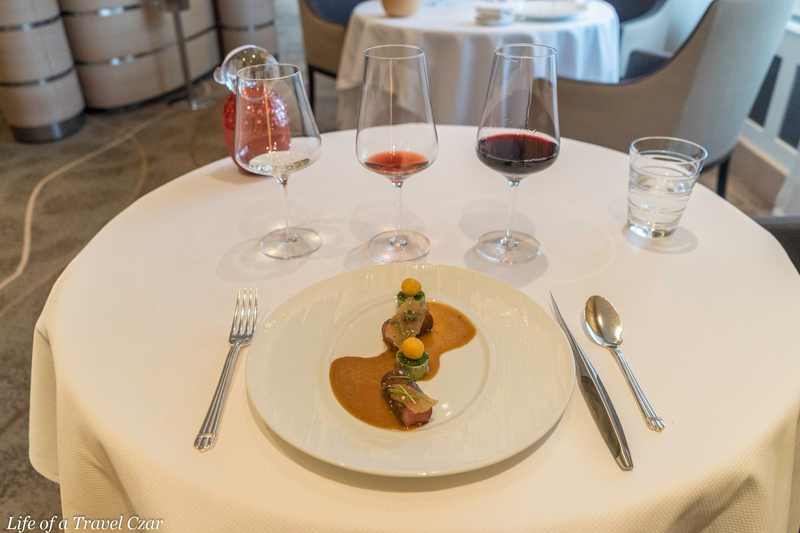 The general theme of the dining experience is fine produce, dishes executed with culinary precision, aesthetically presented and accompanied with rich sauces which in turn necessitated wines with good acidity to cut through or good tannins in the case of the lamb to wash through the palate. The produce was incredible, the mix of flavours and culinary execution almost without flaw. 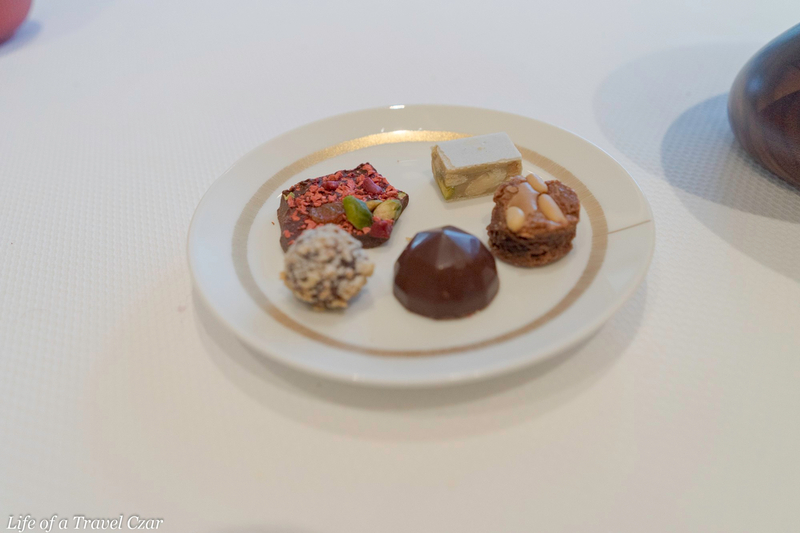 The menu included scallops, foie gras, caviar, truffles, pollock, lobster, lamb, high quality chocolate and of course the exotic fruit ice-bomb which provided a very complete experience. 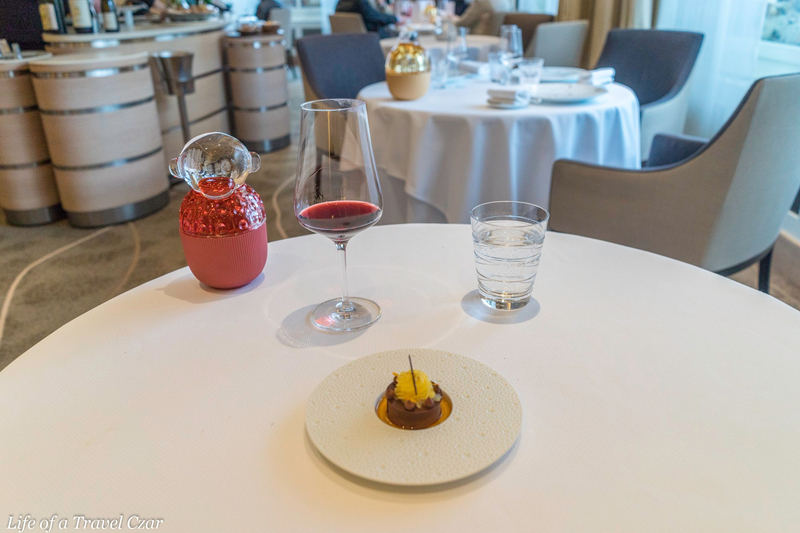 The dining room setting was oh so beautiful and there is a sense of conservatism to the tone and nature of the room which allows you to focus on the culinary experience without distraction. The sommelier deserves special credit for his selection and knowledge of wine. A good variety of Swiss, French and Italian wines were chosen. 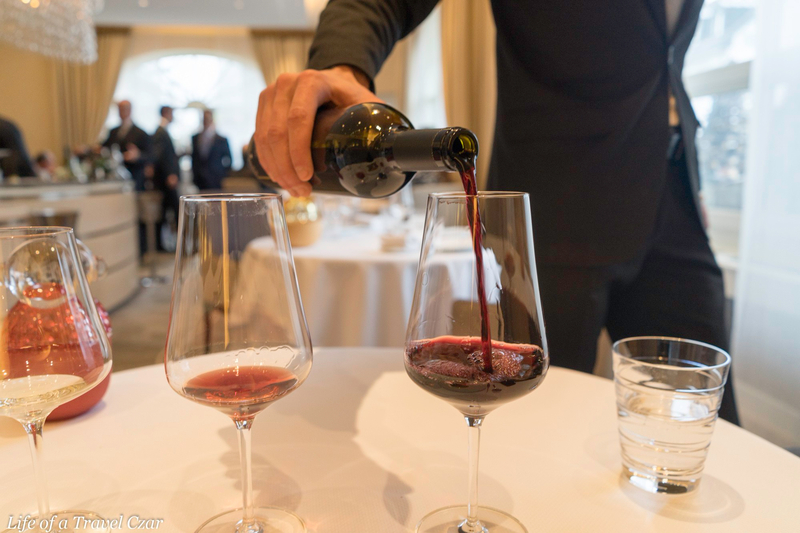 The was a broad selection of different varietals and there were some interesting pairings (Nebbiolo with lobster) and his explanation of the wines could not be faulted. 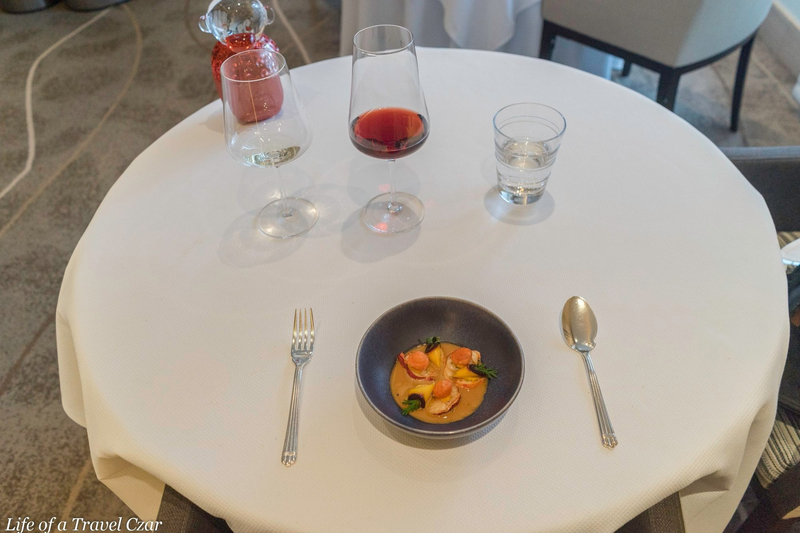 However there were a couple of areas that probably needed to be addressed, which is a pity given the context of the very high standard of the food and wine. When I arrived, I was initially ushered into the kitchen to dine at a make shift table on the counter (not the actual kitchen table). I can understand some dining aficionados love it but I am always a white table cloth dining room person. I was quite uncomfortable and wasn’t sure how to complain and I think one of the staff realised the body language and noted there was space in the dining room if I wanted it. I think the restaurant should have asked for the preference when I arrived to avoid the awkward moment. The harmonisation of the kitchen in bringing the dishes out needed improvement. 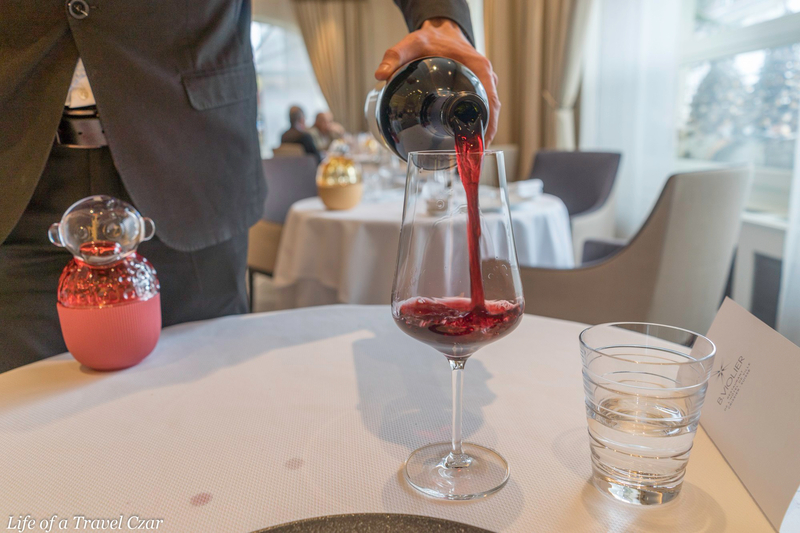 The standard should be that the matching wine is poured, then the dish brought out and in true Escoffier style the accompanying source poured over. The majority of the dishes were brought out before the matched wine was provided. Which meant that the ability to savour the wine was limited as I didn’t want the dish to cool any further. 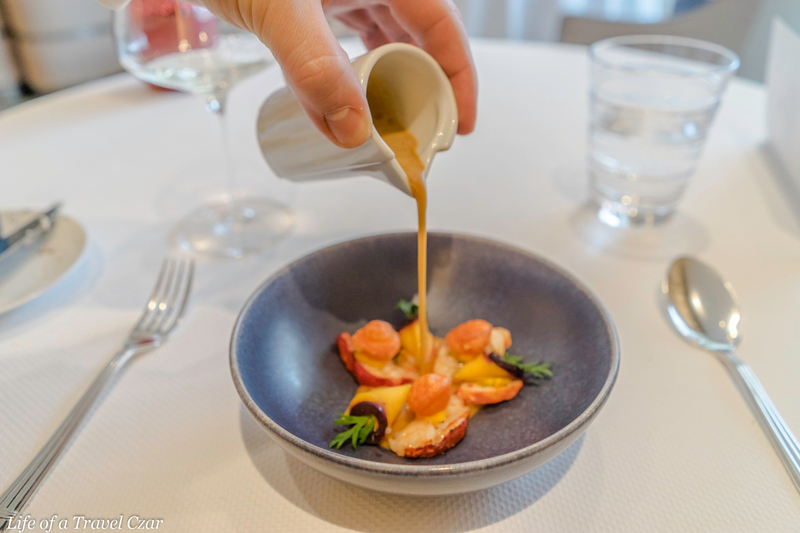 The dishes presented sometimes had limited explanation about the ingredients and I did have to ask more clarifying questions that I probably need to. My sense is although these two points did detract from the experience, this restaurant is certainly worth the visit. It does make for an enjoyable day when you disconnect with the city and find a sleepy town with some of the world’s best cuisine.